I am not a very ritualistic person. I am kind of wishy-washy around them. If a ritual is something that my heart takes after and is easier to get done with, I will do it. If not, I will probably skip. I am not a very religious person either or rather I am not very ritualistic about the religion that I follow. 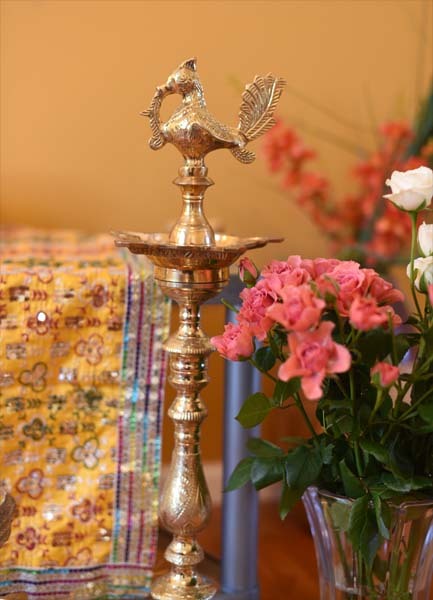 I like praying and I light incense sticks almost every other evening for a set of gods in my Puja corner. It doesn't matter if I am having my periods, I will still do it. If I don't feel like on some evening, I don't. This is very different from the way I have grown up in a home where rituals were strictly adhered to. With age, I see my parent's vision has changed regarding religious rituals too. My father is no longer as conservative as he was some twenty years back. He reads vedas and the other day was telling me, how some of the words in Sanskrit mantras like "Hrring", "Krring"-- which are actually sounds(dhwanis) with no literal meaning -- were actually derived from the sounds of nature, which was what the early humans were afraid of and thus prayed to. His belief in the ritualistic form of prayers has waned too, making it easier for me to relate to his pujas. 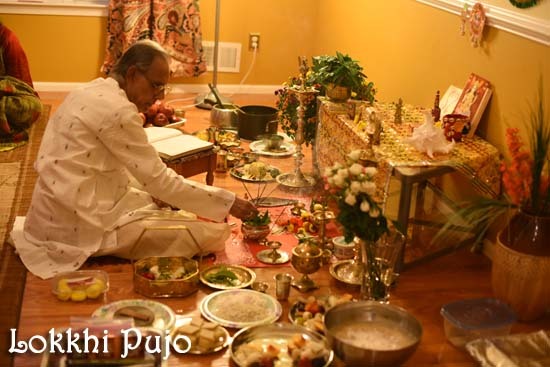 So this time when my parents wanted to do the Kojagari Lakhsmi Pujo , which they have been doing at their own home for many many years on the night of the first full moon after Durga Pujo, I agreed to all the little nuances. I do this Pujo, other years too, but in my own very random way. 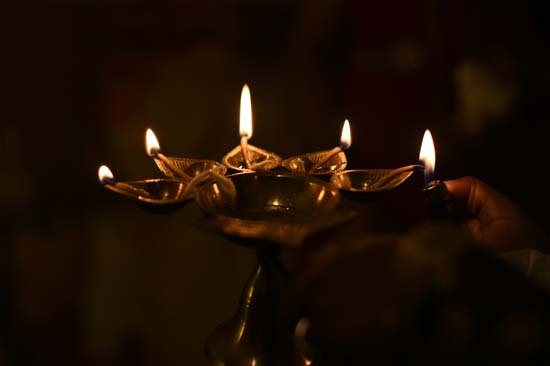 This time I agreed to the rituals as they did not seem too rigid and gave me excuses to buy the the brass lamps I have always had eyes on. Since we were having the Pujo, I asked my Mother to make Shinni. Shinni, is a very simple prashad made with atta(whole wheat flour), sugar, bananas, milk--- many of you are thinking banana bread at this point but no--all mixed together with hand and offered to Lord Satya Narayan. This is a typical prashad made only during SatyaNarayan Pujo but I love it so much that I insisted and my Mother obliged this time. 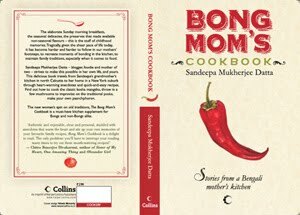 A Bengali Food Blog and not a single Sondesh recipe in there. "Chee, chee, ...", the Bengali Mashima in her wide red bordered spun cotton sari spat out a stream of betel juice in disgust. The other ladies in their filigreed gold bangles stopped midway in their task of "boron", feeding Ma Durga pieces of sondesh and smearing her with Sindoor on BijoyaDashami, and looked at me with rebuke writ on their face. Ma Durga's face shimmied in the rectangular mirror placed for Dorpon Bishorjon. I hate betel juice and was about to say a few choice words to Mashima when the darn alarm went off. Phewww...so this was just a dream, I looked around trying to spot betel juice stains lurking in any corner. None. That settled, I switched my thought to Sondesh or rather Shondesh. Really , why did I not have a decent sondesh recipe on my blog ? I did have two "faankibaaji" recipes but not the real deal. Why oh Why ? "Wait. I can explain", I said. And then I gulped for what I was going to say was close to blasphemy. But "Honesty is the Best Policy" was my favorite topic to write essays on and so I decided what the heck...I do not like Sondesh. That is the sweet Sondesh. I have always liked the children's magazine Sondesh but that we are not discussing here. There, I said it. Sondesh does not feature among the sweets I would like to eat after I have come back from Mars or the Alcatraz. Nope. I will take Kalakand, KheerKodombo, Crisp raas soaked Jilipi, ChamCham, Kheerer Shingara, Motichur Laddus, Chanar Jilipi, Ledikeni, Kheerer Naaru, LobongoLotika and then, only then shall I consider the Sondesh. I have no concrete reasons why I don't like it given that all my childhood, my Ma kind of force fed me Sondesh. 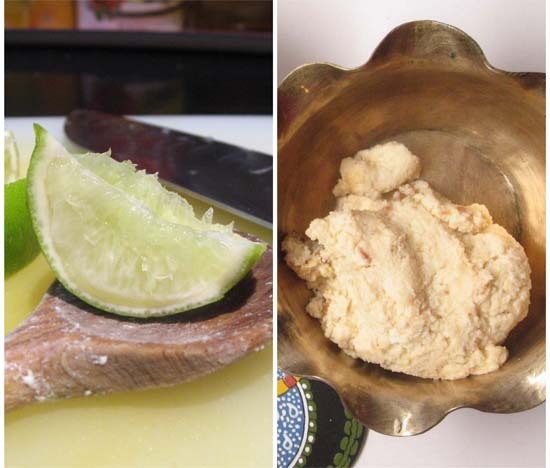 Every winter vacation that we spent in Kolkata was marred by huge Kara Pak er sondesh from Balram, Taal Shaansh sondesh or Jol-Bhora sondesh made of nolen gur with a spot of liquid jaggery in the core from Sen Mahashoy, creamy white shaankh sondesh shaped like a conch from the Kalika Mishtanno Bhandar near my Dida's home and several variations of the same stuff again and again. In absence of these in our Bihari town Ma made them at home, making fresh chhana and shaping the sondesh with her dark black stone molds.I hated them all. Well "hate" is a strong word but I didn't really take to Sondesh like a Bong should. I did prefer the "Makha Sondesh", moist, warm and fresh over the harder and dried Kara Pak er sondesh but nothing to go ga ga about. The only variation of sondesh that I like is one where my Ma adds kheer to the channa and thus makes a Kheer-Chhanar Sondesh. Many, many years later I made norom paak er sondesh at home on this Bijoya Dashami. As if the house move was not exciting enough and I needed more. I had a stash of Khejur Gur from last year and I wanted to use it to make Nolen Gur er Sondesh . I used both sugar and the jaggery but if you have enough of the Khejur Gur I suggest you use more of it. So anyway the sondesh was easy to make and pretty decent to eat, so it is definitely worth a try. If I could have done it, so can you. And then if you fall in love with the famous sweet all the more better for you. Nolen Gur er Sondesh -- This is a sub-species of Sondesh found only in the winter season. 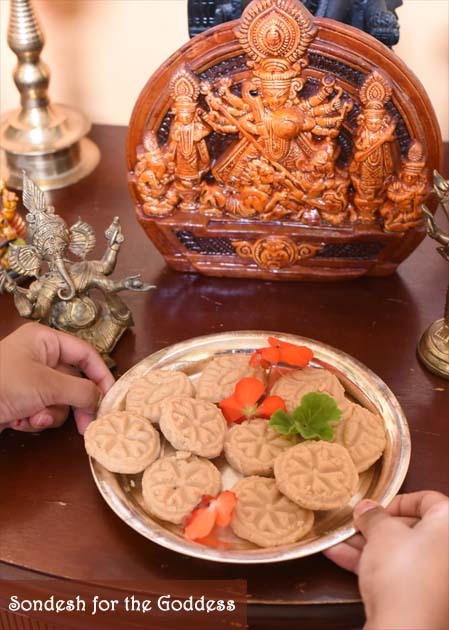 The sweetener for this Sondesh is Date Palm Jaggery or Khejur Gur. This enchanting and aromatic jaggery is made by collecting the fresh sap of Date Palm Trees on foggy winter mornings. The Notun gur er sondesh has a coloring that varies from pale to a deeper shade of brown and a heady aroma if the Khejur gur is good quality. Kaanchagolla -- In this variety the fresh warm chhana is kneaded with sugar or jaggery and then tossed into balls.The chhana is not cooked for this. Natore, a town in Bagladesh is famous for its Kaancha Golla. Kora Paak Sondesh -- This is a harder variety of sondesh where the chhana/chenna is stirred for a longer time to make it hard. I have no idea how they then mold or make shapes out of it. A very interesting article on Sondesh of Kolkata is here. Note: Adjust the sugar and jaggery to your taste.You can use no sugar and all jaggery too. Bring 4 cups of whole Milk to boil. When the milk is boiling add about 2tbsp of Lime juice. Lower the heat. Almost in seconds you will see the milk curdle and clumps of white milk solids forming.When you see the greenish water separating take it off from heat. Let it sit for 30 secs or so. Now line a colander with cheesecloth and drain the chhana/chenna/paneer. The greenish hued whey is great for making roti dough says my Ma. Next lightly rinse the chhana with water to remove the lemony taste and let it drain. 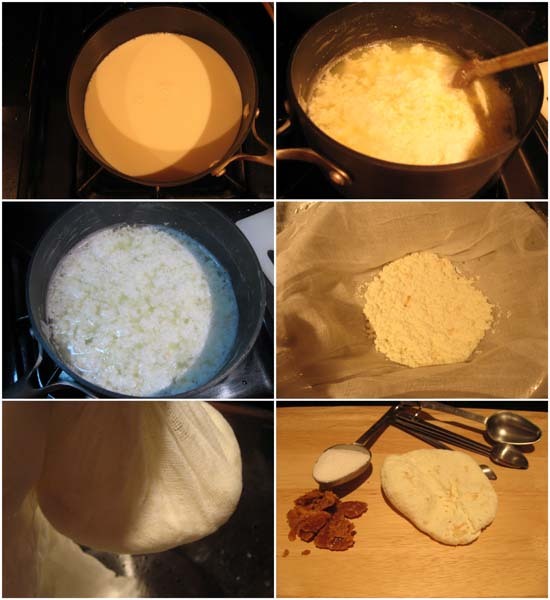 After few minutes gather the ends of the cheesecloth to form a purse like shape and squeeze out the remaining water from the chhana. Next put it on a flat plate and weigh it with a slightly heavier object and let it remain like that for the next hour.I used my mortar for weighing down, I remember my mother using her nora. Now we have to knead the chhana. Knead the chhana with the heel of your palm for about 4-5 minutes. Add about 1/8th cup of fine sugar and knead for 4-5 more minutes until the sugar is totally mixed with the chhana. Since the khejur gur is usually hard, we will microwave 1/8th cup of jaggery + 1 tsp of water for few seconds to soften and then add it to the chhana. If your khejur gur is already soft, you don't need to do this. Knead for 5 more minutes until your palm is oily with the fat from the chhana. At the end of this kneading, the chhana will look like a smooth ball of dough. Take small portion of it and toss to make small balls. These sweetened balls of raw chhana are called KaanchaGolla. Now we will do the "paak" or cook. Since I am doing a Norom Paak er sondesh we will be cooking the chhana at a very low heat. To add saffron to sondesh, warm 2 tbsp milk in microwave and soak saffron strands in it. Put a non-stick pan on low heat and add the kneaded, sweetened chhana. Add the saffron and milk. Stir and cook at low heat. Keep stirring with a spatula for next 10-15 minutes or so. The chhana should come together and will no longer stick to the pan by the end of this time. Take a small portion of the chhana and try rolling a ball. If you can make a smooth firm ball, the chhana is ready! Now take out the warm chhana and immediately shape with molds or just toss into balls. If you wait, it will harden and you cannot shape it. For further decoration you can warm few strands of saffron in drops of milk and dot each sondesh with the saffron or add bits of pista. 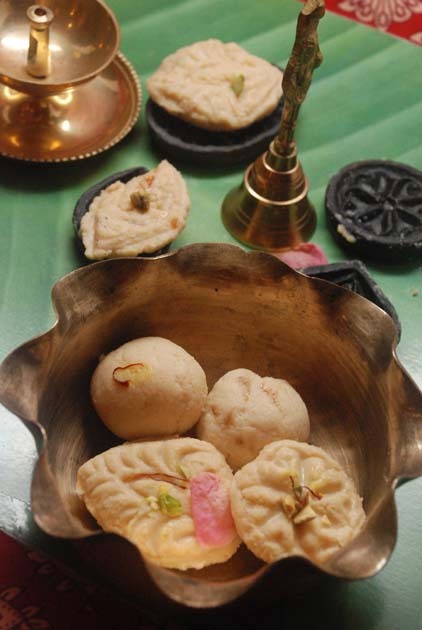 On this Mahalaya, we made sondesh again. 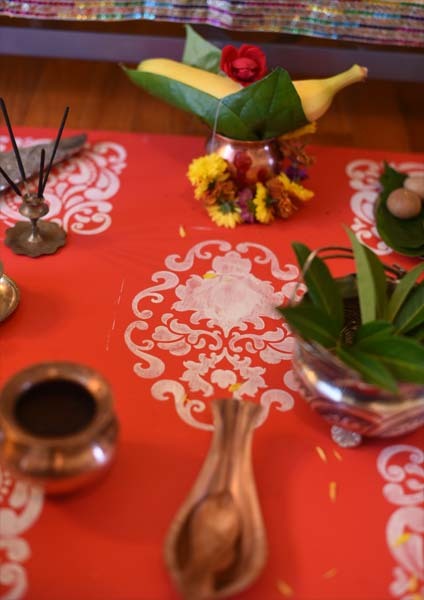 My Mother presided the process, the girls helped in kneading the chhana and shaping the sondesh and I did the rest. 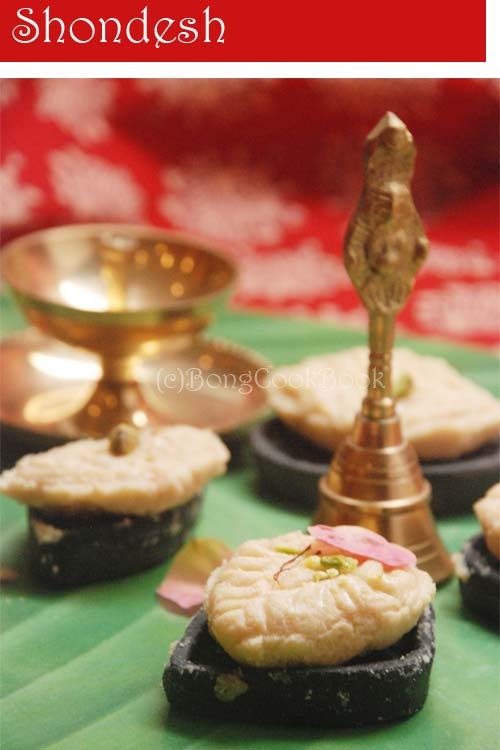 Three generations of women made sondesh on Mahalaya to welcome the Goddess. It seemed to hold a special meaning for us. This time, as advised by my friend J, I mixed khoya and chhana to make the sondesh. I liked this one better than the ones made of pure chhana but if you like the pure chhana sondesh stick with the previous recipe. Bring 2 litres of whole Milk to boil. When the milk is boiling add about 2tbsp of Lime juice + 1 tbsp of Vinegar. Lower the heat. Almost in seconds you will see the milk curdle and clumps of white milk solids forming.When you see the greenish water separating take it off from heat. Let it sit for 30 secs or so. Now we have to knead the chhana. Knead the chhana with the heel of your palm for about 5-10 minutes. Your palm should be oily at the end of kneading and the chhana should have come together. Add about 1/2 cup of fine sugar and knead for 4-5 more minutes until the sugar is totally mixed with the chhana. At the end of this the chhana will look like a smooth ball of dough. Now we will do the "paak" or cook. Since I am doing a Norom Paak er sondesh we will be not be cooking the chhana to hardness. We will also add the khejur gur at this point. The khejur gur is usually solid, so in a microwave safe bowl, add 1/2 cup of loosely packed Khejur Gur and 1 tbsp of water. Microwave for a minute or until the jaggery melts. For the "paak", put a non-stick pan on low heat and add the khoya and the liquid jaggery. Stir around for couple of minutes. Then add kneaded, sweetened chhana. Mix with your fingers. Keep the heat at low so that you can mix with hand. After you see that the khoya and chhana have mixed together, raise the heat to medium and stir continuously for the next 15 minutes. The chhana mix will slowly come together and will no longer stick to the pan. When you can take a little of it and make a ball, you know it is done. 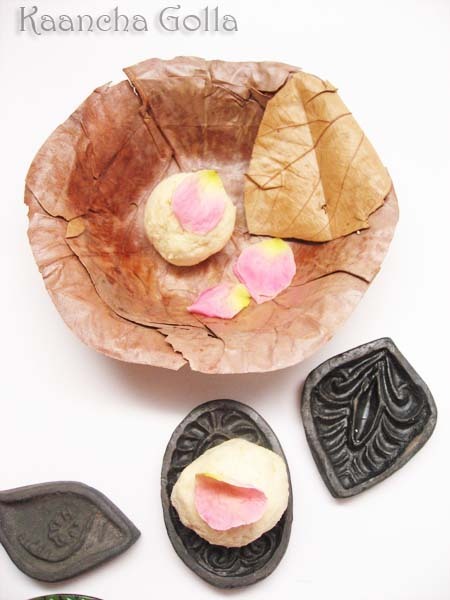 Now take out the warm chhana and immediately shape with molds or just toss into balls. If you wait, it will harden and you cannot shape it. If you have the sondesh moulds, grease them with ghee. Put a ball of sondesh on the mold and press to flatten it out so that it hugs the shape of the mold. Gently pry it out and put on a plate. Keep a bowl of water handy to dip your fingers and proceed with the next ball. For further decoration you can warm few strands of saffron in drops of milk and dot each sondesh with the saffron or add bits of pista.